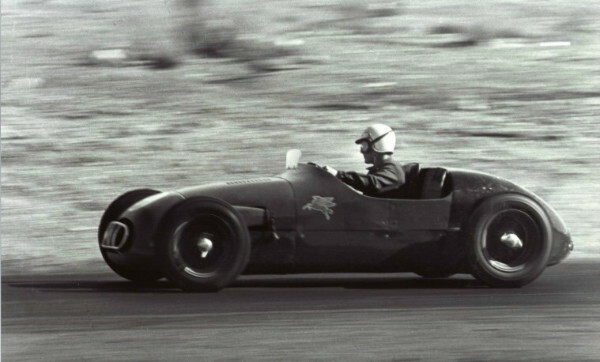 was a completely handbuilt two-seat midget race car designed for road racing in 1954. Historian Ron Cummings and Old Yeller restoration expert Reagan Rulau contributed these photos and information. This neat little car was built by westcoast midget owner & driver Whitey Thuesen. It ran at the first Willow Springs Cal Club event and early Torrey Pines races. It was originally powered by a Crosley V8 that Thuesen built using two Crosley blocks and a common crankcase that he machined out of a solid block of metal. 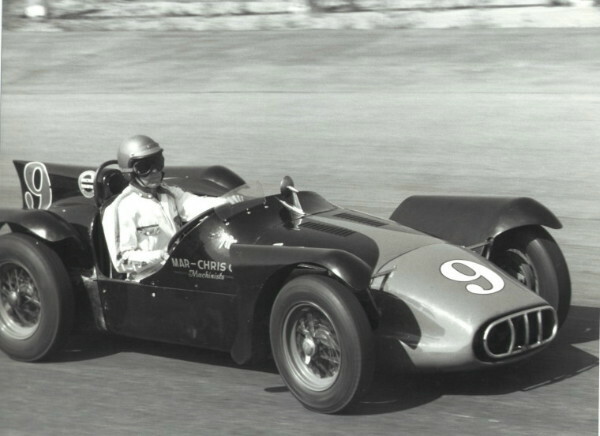 After his partner walked away, Whitey installed a 1500cc Offenhauser midget engine and it was mostly driven by Bill Cantrell. It ran the first Los Angeles Times G.P. and many RRR races. 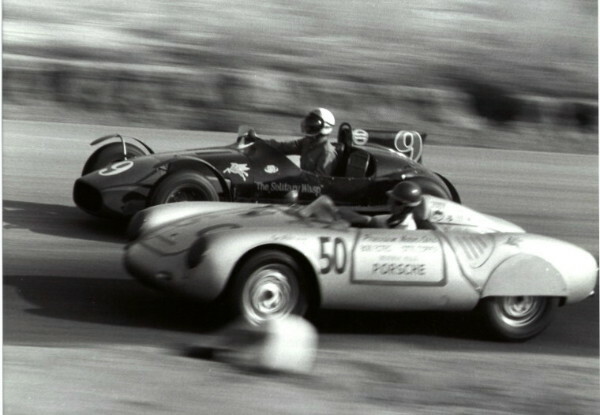 It could not keep up with Ken Miles and the 550A Spyder (photo above) but could nail the earlier 550's. "Whitey was a pre-WW2 midget car driver and owned a famous midget that once won 'Turkey Night'. Cantrell was a famous SoCal. midget driver and not the nationally known Indianapolis driver with the same name. Does anyone in general or from the midget or sprint car crowd have any more photos or information on this little car? Photos of Thuesen's machine shop would be greatly appreciated. Whitey was a brilliant machinist and raced both ovals and road courses. I'd love to hear from anyone that dealt with him. His work speaks for itself. I can't do better then what he did. I can only match it. Not too many restorers can claim the original machine tools in their possession that were used in the construction of a particular car. I have Whitey's lathe and milling machine that he used to build this car. "Many do not know that Whitey was one of the original midget drivers when Dominic Distarce started the sport on a weekly basis at a track located at Loyola High School on Venice Blvd. in 1933 or 34! Whitey was a friend who had my RRR suspension reversed and got me the ride in Jack Furcho's Jag XK-140. He also fit checked me for the Offy and told me I had the ride whenever Cantrell couldn't make it to a race due to other commitments. But I never had the chance to drive that beautiful machine. It had a two speed Quick Change rear end and a two speed gearbox. Whitey gave me explicit instructions how to operate the system, in case I had the chance to drive the car. Bob Schilling used to work for Whitey at his shop and should be able to tell you a lot about a really neat guy." Next: "Solitary Wasp -- 2"
Back to: Lou Brero's Kurtis 500S-Cadillac!